With NCAA basketball just tipping off many teams unveiled not only new players and possibly uniforms, but some, have new basketball floors. 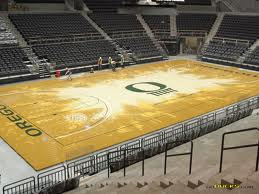 Last season, the most talked about floor belong to the University of Oregon Athletics Department unveiled their new basketball court, which set their facility apart from any other arena in the country. Installation of a unique arena floor is currently underway and features symbolic references to the Pacific Northwest, as well as the two individuals most responsible for the arena becoming a reality, Phil Knight and Pat Kilkenny. 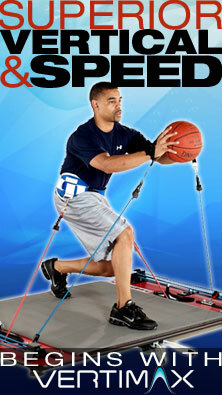 For more, click here. The University of Illinois men's and women's basketball teams unveiled a new floor design at the teams practice faciltiies, Ubben Basketball Complex. The practice facility, which opened in 1998, has featured four different floors throughout its 13-year history. Check out the photo galleries above to see the latest shots of the new floor and a through-the-years look at the court. The Assembly Hall also is scheduled to receive a new floor for the 2011-12 basketball season, which will feature a similar design to the Ubben floor. 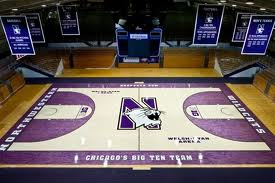 In a nod to the power of social media, officials at Chicago's Northwestern University picked the new court design for its Welsh-Ryan Arena based partly on the number of Facebook "Likes" it received, according to NUsports.cstv.com. And it's clear the fans were thinking outside the box. Instead of using paint for the new court design—as is traditionally the case—a substantial portion of the court has been stained so that the wood's grain will show through. The West Virginia University-Morehead State basketball played its first game on a newly installed floor at the Charleston Civic Center. It was purchased from Connor Sports Floors and has previously been used for only four basketball games during the NCAA Final Four Women's Basketball Tournaments in 2010 and 2011. Kansas State unveiled the refurbished floor Monday at Bramlage Coliseum in Manhattan. 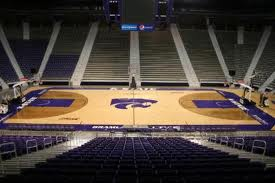 The design features a purple Powercat logo at midcourt and a purple octagon outlining the floor, with the "K-State" wordmark in white along the sideline. 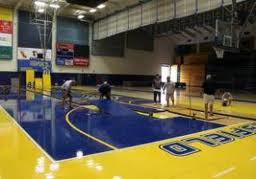 Continuing with the trend of generating fan and media attention with an attention-getting athletic surface (á la Boise State University's football field), Cal State University, Bakersfield recently installed a blue basketball floor in its 3,800-seat Icardo Center. Hopefully for some, the new floor will allow the home team to have not only a visual advantage but the ball bounces in their favor. 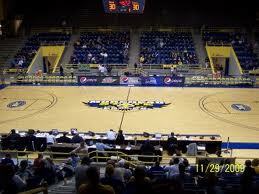 Unfortunately, Morehead State lost its first home game to West Virginia, 83-48.